WASHINGTON (CNS) — After a first-weekend box office take of $25.6 million, actress-producer Roma Downey plans to take the movie “Son of God” into other markets. “We have a big rollout planned. Our attention is slowly being brought to global distribution,” Downey said in a March 7 telephone interview from Los Angeles with Catholic News Service. There are plans afoot to expand the reach of “Son of God” within the United States as well. 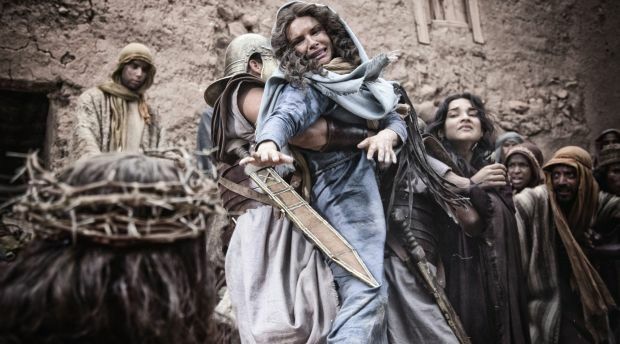 A Spanish-language version of the film, a dramatic retelling of Jesus’ life, made it to 200 U.S. screens in the first weekend of release. In its second weekend, that number jumped to 350. Many younger Hispanic moviegoers are bilingual, but “many of the older members of their families are not,” Downey said. “You bring your mom, bring your grandmom, bring your family together in community to experience it together. I think the Spanish community has been underserved in so many ways.” Versions of “Son of God” with Korean and Mandarin subtitles are also expected soon in U.S. theaters. Even so, “we exceeded the studio’s expectation,” Downey told CNS. “We could have had half that (business in the first weekend) and it would have been considered that it did well. We gave ‘Non-Stop’ a run for its money. The initial weekend’s turnout likely benefitted from many denominations and churches buying out entire theaters to screen the movie for its members. Promoters of “Son of God” were aware of four U.S. dioceses that did the same. “Son of God” also got a boost from endorsements by leaders in several different faiths. Among the Catholic prelates who endorsed the film were Cardinal Donald W. Wuerl of Washington; retired Cardinal Roger M. Mahony of Los Angeles; Archbishops Jerome E. Listecki of Milwaukee, Jose H. Gomez of Los Angeles and Gustavo Garcia-Siller of San Antonio; Bishops David A. Zubik of Pittsburgh, David L. Ricken of Green Bay, Wis., William F. Murphy of Rockville Centre, N.Y., and Kevin W. Vann of Orange, Calif.; and retired Bishop Jerome C. Hanifen of Colorado Springs, Colo.
Other prominent Catholics back the production include Supreme Knight Carl Anderson, of the Knights of Columbus; liturgical music composer John Michael Talbot; and actor-producer Eduardo Verastegui. It was classified A-III — adults — for “strong gory violence,” due to scenes deal with Jesus’ crucifixion, but that given the subject matter, it was “probably acceptable for older teens,” Mulderig said.